Iowa Personal Injury Statute of Limitations | Hupy and Abraham, S.C.
How long do I have to file a personal injury lawsuit in Iowa? 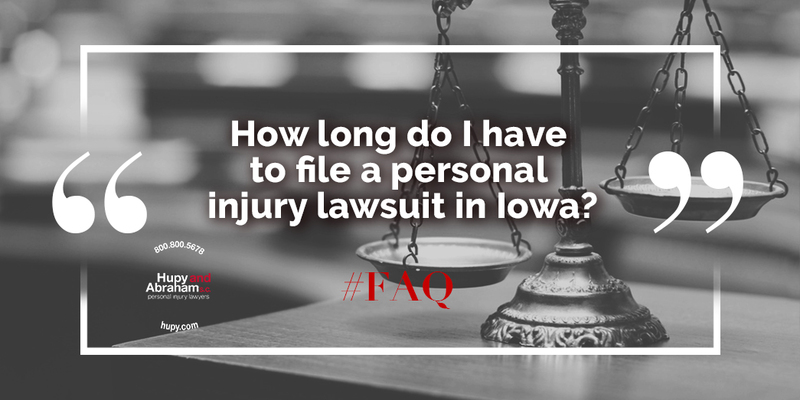 According to Iowa Code §614.1(2), you generally have two years to file a personal injury lawsuit in an Iowa court. While the Iowa statutes are clear on this timeframe, there are some factors that could make lengthen or shorten the statute of limitations for you. Regardless of when your personal statute of limitations will end, it is important to take action quickly. There is no need to wait until the statute of limitations is about to expire to contact a personal injury lawyer. Instead, you can begin preserving evidence and getting the recovery that you deserve as soon as you know that you are hurt by contacting us today for a free consultation. Has a mental illness at the time of the injury. Is a minor at the time of the injury. In these circumstances, Iowa Code §614.1(8) provides that a lawsuit may be filed by the person who was hurt within one year from the time the mental illness ends or the time the minor becomes an adult. Of course, this assumes that a parent or legal guardian did not file a case on the injured person’s behalf earlier. Similarly, the time for filing a personal injury case against a government entity may be shorter than two years because of special rules about suing government employees and agencies. You need to know when your personal injury statute of limitations will expire so that you don’t miss it. If you do not file your case before the statute of limitations expires and you file it after the legal deadline then you should expect that the defendant will file a motion to dismiss your case which will be quickly granted by the court. You won’t be able to recover any damages. Don’t let this happen to you. Instead, learn more about how a personal injury case works in Iowa by browsing our free articles, contacting us online or calling us directly at 800.800.5678 today.